When I hear the word Renaissance, I think of powdered wigs, exaggerated collars and pantaloons. Images of Renaissance Faires play like a slide-show through my mind, I crave turkey legs and nearly feel the tightening of a corset. In actuality, the Renaissance was a freeing time for humanity rather than wholly constricting. The word Renaissance, translated to English from French, means rebirth. In times of upheaval, the creative arts seem to suffer most. During the shift between the Middle Age and the Renaissance, a span of a century passed without new advances in poetry. I think it is an unwritten law that poets will always exist but the poets of the 1500s did not offer new insights to the craft or language. Instead, they seemed bent on mimicking Chaucer’s great voice and works, attempting to piggy-back on his success. In a way, it is understandable. The fifteenth century was a time of change, a time where the Middle Age was suffering a painful death, Church and State were under siege and an underground intellectual movement was gaining momentum. Four great events happened over the change of centuries that ushered in the next movement in literature. These events were the invention of printing, the revival of classical learning, the discovery of America and the Protestant Reformation. Although I cannot go into the details of any one of these events in this article, each alone is incredibly complex but when combined, they make for a powerful force, powerful enough to put the Middle Age cleanly into the past and usher forward the rebirth. The movement to revive classical learning has its roots in Italy where scholars revisited the works of the ancient Greeks and discovered the inspiration that had been absent. After centuries of being stifled by the Church as the sole source of knowledge and understanding, these writings freed scholars in the sense that the human mind knows no boundaries, a freedom of thought that had been suppressed. This sparked the Humanist movement that allowed renewed emphasis to life in the present world instead of solely focusing on spiritual contemplation as was practiced in the Middle Ages. As this is a poetry group, I can’t allow myself to venture too deeply into history (although I am tempted) without keeping tabs on the literary aspects of the Renaissance. I believe that at this point, you have hints of the labor pains of the rebirth and can sense their importance in the great literary shift between Middle Ages and the Renaissance Movement. The poem and the drama were both dominant in English literature during the Renaissance. Sixteenth century poetry included the lyric, elegy, tragedy and pastoral forms, usually ostentatious, repetitive, and infused with subtle wit. “Conventions played a large part in how particular poetic styles were manifested. Expectations about style, subject matter, tone, and even plot details were well-established for each poetic genre. Even the specific occasion demanded a particular form of poetry, and these tried and true conventions were tacitly understood by all.” Despite the influence of conventions, poets experimented with forms, combining themes and creating new methods of expression. During the English Renaissance, John Milton composed his epic Paradise Lost, widely considered the grandest poem in the language. This epic poem was written in blank verse, poetry written in unrhymed iambic pentameter, tells the biblical story of the fall from grace of Adam and Eve in language that is an astonishing achievement of rhythm and sound. One of Milton’s most effective character representations in Paradise Lost is his sympathetic portrayal of Satan, essentially placing Satan in a potentially heroic position. However, in the following excerpt, Milton counters this proposition in defining his epic poem as a teodicy or a “defense of God’s goodness and omnipotence in view of the existence of evil” (Merriam-Webster 1223). In this dual purpose, he focused both on the literary aspects and the theological argument. Just as I have to take care not to forget poetry in place of history, I am greatly underqualified to make theological arguments or debate. I will let William Blake’s infamous comment regarding Milton’s portrayal close the discussion regarding religious implications and ideals. 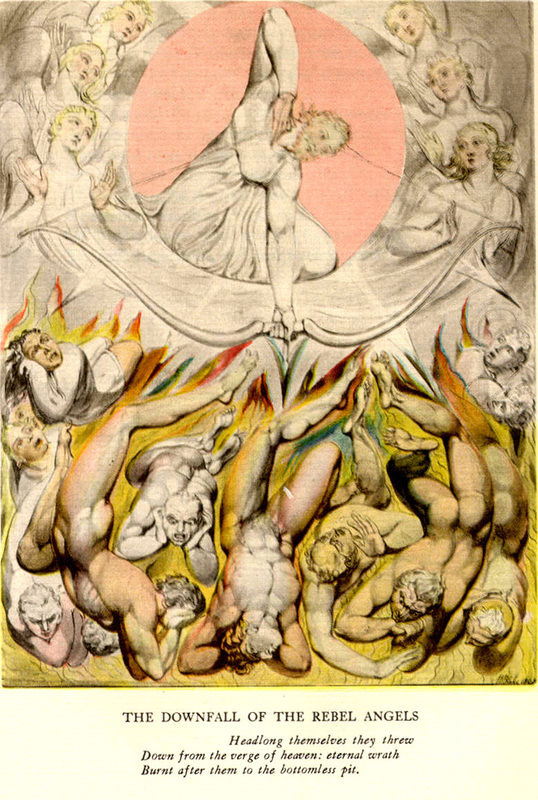 “The reason Milton wrote in fetters when he wrote of Angels & God, and at liberty when of Devils & Hell, is because he was a true Poet, and of the Devil’s party without knowing it” (Blake 1433). In closing, I want to thank the Italians for revisiting the ancient Greek texts, the underground movement for seeing us as humans with unique freedom of thought and expression, Milton for exercising his talent in astounding poetry, readers of this post for tolerating my temptations to stray from the primary purpose and dVerse for exposing me to opportunities to learn with every article. I am also grateful that I’m not wearing the attire of the Renaissance period. July is too hot for wigs and corsets. Luxon, Thomas H., ed. The Milton Reading Room, Dartmouth College, July, 2013.
are you sure we cant have turkey legs? Thank you, Brian 🙂 I’m here now. You can have all the turkey legs you want, even my share. Thanks for another fascinating article, Beth. I can’t help seeing the similarities between the Renaissance and our own times – something that others have commented on frequently. I think in particular of the effect of the web, which parallels the development of the printing press, and changing attitudes to church (and other religious institutions) and the state. oh i as well….gimme the smell of a book…serious aphrodisiac…just saying, ha. Beth, thank you for the time and effort you put into researching and writing these “pretzels.” I can’t help but think of what the “aromas’ of the renaissance must have been. I remember visiting Versailles…no place for bathing, and those heavy clothes and, oy…anyway, a bit of a perverse take on things. But the beauty of the arts that that epoch produced–for that we are definitely grateful. *nose crinkles* Though the aromas should have been a focus, sadly, what we consider stench and unsanitary was normal for their lives. I’m very grateful to live in the age of deodorant and modern plumbing. Thanks, Claudia. Poetry made a comeback during the Renaissance movement, as I will dig into deeper next month. I’m so pleased you enjoy these articles. I learn a great deal with each one. Intriguing… poetry has no dimensions.. no restrictions..
if spirituality be considered, I have always deemed poetry or any creative craft, a language of the soul..
As any creative craft is language of the soul, I believe it defies the conventions of both church and state, goes beyond religious beliefs and challenges the reader to expand vision. The Humanistic ideals of the Renaissance movement freed us to become creative to this day. Beth, I love your posts. Thank you so much for the interesting articles. My creative side composes in iambic tetrameter so I fully understand. Sadly, many discount meter simply because they either don’t understand it or they feel traditional is archaic. Either way, the structure is part of my voice and will remain. Thanks so much.